Choose fresh elegance with this green and sterling silver belly bar. 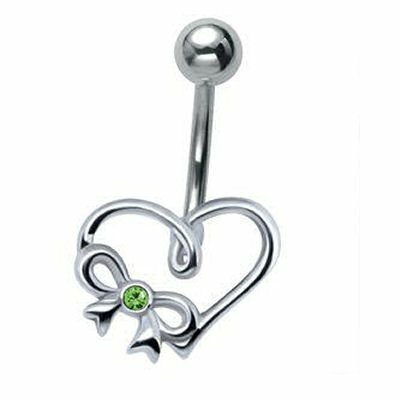 This bar features a polished sterling silver heart with a green jewelled bow. It has a sweet, sophisticated look that shows off your piercing and looks gorgeous against your skin. This heart belly bar has a surgical steel stem with a solid sterling silver heart. The steel stem is non-irritating and easy to clean, so it feels very comfortable to wear. This belly button bar is easy to wear and comes in a choice of lengths to suit your needs.